The Wheeling Township Arlington Heights Cemetery is located on the north side of Euclid, west of Rand Road in Arlington Heights. It was the original burial site for the Kennicott family and a number of tombstones date back to the early 1800's. Names like Kennicott, Sigwalt, Noyes, Landmeier, Klehm, Best and Miner are all there. These early settlers' names also can be found on streets throughout northwest suburban Villages, a tribute to the early and influential role they played in the area's history. 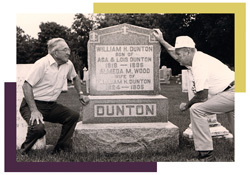 About 20 members of the Dunton family - the name by which the town of Arlington Heights was known until 1887 - are also buried in the Township Cemetery. The three Township appointed trustees - John Glueckert Jr., Jon Kolssak, and Anthony Camacho- are responsible for sales and contracted maintenance of the four-acre cemetery. They devote a great deal of time and personal interest seeing that the Cemetery, a little piece of history in the midst of modern suburbia, is carefully preserved and maintained. Burial sites are available for purchase for $500 each to township residents, or immediate family members of township residents, immediate family members of those already buried there. Messages for the Trustees are taken at 847-259-7730. The Wheeling Township/Arlington Heights Cemetery conforms to the Cemetery Oversight Act (Public Act 096-00863). The Wheeling Township/Arlington Heights Cemetery is governed by three Cemetery Trustees and all questions shall be directed to the trustees. The Wheeling Township /Arlington Heights Cemetery reserves the right to adopt new rules, and to amend, alter, or repeal any rule or regulation listed. No lots shall be used for any other purpose than as a place of burial for the human dead. The current purchase price of a single lot is $500 each and can be used for one full burial and up to two cremated remains burials, or 3 cremated remains. Each burial requires a burial fee and an interment fee. An interment fee of $150 is due at time of each burial. Each additional burial charge is $250, plus an interment fee of $150. The Wheeling Township/Arlington Heights Cemetery Trustees have the option to repurchase gravesites at the lesser of 1) current purchase price less a transfer fee of $100 per site, or 2) the original purchase price. Lots cannot be sold or otherwise transferred, except through inheritance. Burial of all types (caskets/ashes) must be in a rigid container made of concrete or high tensile plastic. The person for whom the grave is purchased must be a resident of Wheeling Township or the Village of Arlington Heights on the date of purchase, or an immediate family member (spouse, mother, father, brother, sister, children, or grandchildren) of someone already buried at the cemetery. No more than 10 graves may be purchased by one family. Only Cemetery approved contractors are permitted to dig either regular or cremation graves at the Wheeling Township/Arlington Heights Cemetery. Enclosing lots in any way, or creating any type of obstruction to safe and efficient grounds upkeep or pedestrian access, is prohibited. Lot owners and visitors are expected to observe all rules and regulations and to act with appropriate respect and decorum while on the cemetery grounds. No guns, alcohol, or pets, except for service dogs, are allowed on cemetery grounds. All monuments and markers to be placed on gravesites must receive prior approval from the Cemetery Trustees. All monuments and markers must have a concrete foundation. Only a Cemetery approved contractor is allowed to pour foundations. The agreement for the foundation will be between the lot owner and the contractor therefore the Cemetery will be held harmless and void of all responsibility. The Cemetery does not order or install monuments or markers. The owner of the lot contracts with an outside dealer to purchase and install monuments and markers and must receive prior approval from the Wheeling Township/Arlington Heights Cemetery Trustees. All monuments shall be of granite or bronze. No monument or marker shall be intrusive to surrounding lots and shall not cover more than 2/3 of the grave. Enclosures of lots are not allowed. Visitors are reminded that cemetery grounds are devoted to the internment of the dead and proper observance is expected. Vehicles must travel on paved roads only and not exceed a speed of 10 miles per hour. The Wheeling Township/Arlington Heights Cemetery sows grass seed on new graves. Funeral and seasonal flowers, as well as holiday decorations, will be removed and disposed of by Wheeling Township/Arlington Heights Cemetery landscapers in a timely manner. Trees are planted by, and at the sole discretion of, the Wheeling Township/Arlington Heights Cemetery. Lot owners are prohibited from planting hedges, bushes, shrubs or trees. No decorations or plants may be installed/planted on the sides of monuments or markers. Decorations and planted flowers are only allowed where there is a monument or marker and only in front of the monument/marker. No decorative grave blankets are permitted. Glass vases or containers are prohibited. Items that are deemed to be a safety concern for visitors or an obstruction to safe and efficient grounds upkeep, will be removed without prior notification or authorization.